Note: This lab was created using GNS3 but can be completed with real hardware such as Cisco 2620 routers with Cisco IOS Release 12.4(24)T1 and the Advanced IP Services image c1841-advipservicesk9-mz.124-24.T1.bin. You can use other routers (such as a 2801 or 2811). Cisco IOS Software versions if they have comparable capabilities and features. Depending on the router or switch model and Cisco IOS Software version, the commands available and output produced might vary from what is shown in this lab. Use Distributions list to filter BGP routes. Configure primary and secondary default routes . 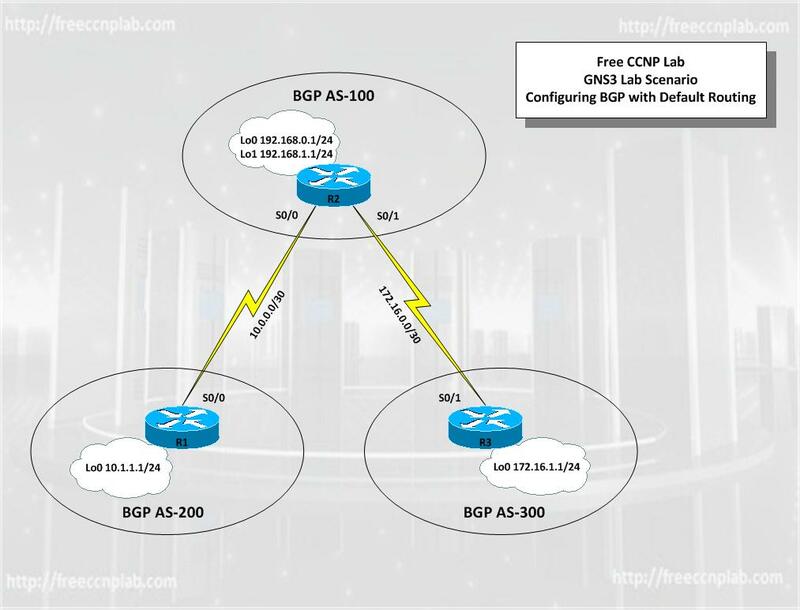 Configure BGP to exchange routing information with two ISPs. Configure the IP address, and subnet on the Loopback interfaces of R1, R2 and R3 as shown in network diagram. Configure the clock rate on the DCE serial interfaces to be 64K. Backup the configuration on all devices. Enable BGP routing on R1, R2 and R3 as shown in the network drawing. Advertise R1, and R3 loopback networks. Configure R2 router to peer with the R1 and R3 routers. Run the following Tcl script on all routers to verify connectivity If these pings are not successful, troubleshoot. Note: The WAN subnets connecting (R2) to (R1 and R3) are not advertised in BGP, so the ISPs will not be able to ping each other’s serial interface address.